What might be better than a crowd of eager runners hungry for a win? Simple: a crowd of eager runners racing to feed the hungry! 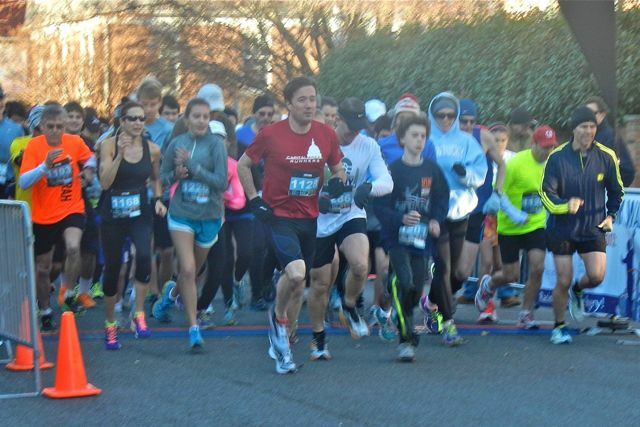 Saturday, November 23, marked the second year that Columbia Baptist Church in Falls Church held its Spend Yourself 5k along the W&OD trail. For runners and organizers alike, this community race holds a clear sense of running for a purpose. Husband and wife team Janine and Daniel Aronowitz organized the annual race as part of the larger Spend Yourself mission: the pair helped orchestrate an event that connects the strength and spirit of running with the pure desire to aid others locally and globally. The primary focus of this race was providing a Thanksgiving meal for families in Fairfax County. Before the race kicked off, runners had a chance to donate food or money to Columbia Baptist Church’s Hunger Ministry. Runners generously donated this year, with few runners coming empty-handed. Neil Eckard, the church’s vice-chair of deacons, was optimistic about this year’s donations. In return for a food donation, runners were entered into a lottery for a free pair of shoes from Road Runner Sports. Being a family-oriented community race, the 8 a.m. start was low-pressure with few runners setting blistering time goals. The flat, out-and-back course offered little difficulty to runners. Marshall High School Sophomore Justin McFaul of Vienna crossed the finish line with a winning time of 17:31. With a previous 5k PR of 16:53, Justin said, “I’m happy with today’s run. Running is just fun.” Like many other participants, Justin was invited to the run by one of Columbia’s regular members. Following the lead, Jeffrey Grabosky of Alexandria pulled in looking strong with a close second at 17:41. Samuel Mrozinski of Silver Spring took third with a time of 18:26. The top female finisher Kathy Goetz of Reston easily won her division (seventh overall) with a time of 20:14. Mary Rachel Robins, also of Reston, couldn’t quite catch Kathy, but posted a time of 20:55. Ellen Meinhart of Falls Church came in third at 21:56. While all of the Spend Yourself runners ultimately supported the event’s admirable cause, many also saw the race as a way to run a convenient local 5k as part of their personal training program. Christopher Carney, Falls Church local and sixth place overall finisher, used the course as a “bounce-back” run after recently completing the Marine Corps Marathon in October. “This race is so close—I could almost walk here from my house,” he said, “I ran [today’s race] at my half-marathon pace.” Chris used the 5k as a recovery run, citing its non-competitive atmosphere as one of the features that made this race a good choice for a post-marathon follow-up. Indeed, Chris was in good company as many of his fellow runners were Marine Corps Marathoners looking to hit the pavement again with a shorter November run. For Hannah Resig, a member of Columbia Baptist Church who also ran the MCM, the Spend Yourself 5k also gave her a chance to return to the type of philanthropy that drives her running. When Hannah ran the MCM, her motivation was a charitable goal, so her desire to run in her church’s 5k was a natural extension of her love of running and giving.